The microscope in use with my head lamps from my bike. Most of my post about Bicycle Botany are about how my bike takes me to distant places to look for plants or about plants that I happen to see on a ride (usually while moving at a snails place up a steep climb, plants are much easier to see that way!). Recently however, my bicycle has made another contribution to my plant obsession. 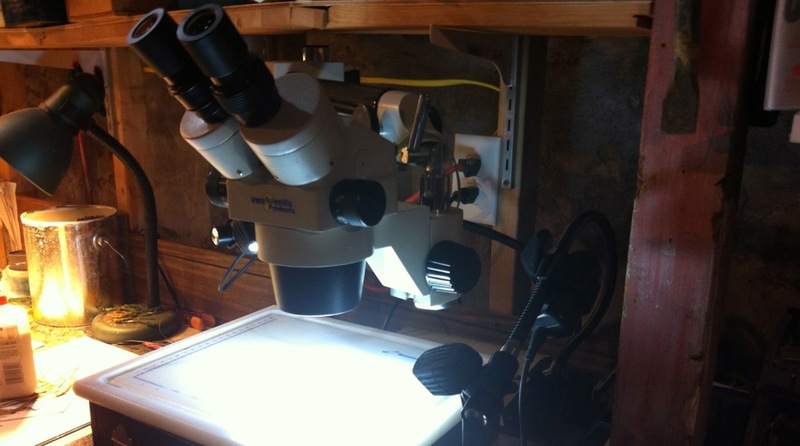 I have a stereo-dissecting microscope with a fiber optic lamp that I use to help identify plants. The bulb in the lamp burned out which renders one's microscope pretty much useless. Here is another view of the set up. The head lamp is attached to the arm of the fiberoptic. The battery is attached in the rear. The bulb is not an easy one to find; a 150 watt 20 amp halogen bulb. I found them on line but being impatient I couldn't wait that long. Instead, I remembered how bright my headlamps (Niterider Trail Rats) on my bike were and wondered if I could possibly use them for my microscope. Since the fiberoptic "arms" were round, like a handle bar, I thought the lamps might mount there just like on my bike. Well the answer is, yes it does, quite nicely in fact. Click on the photos for a better view. They are plenty bright. The only draw back is that the batteries need charging after about an hour or two of use. Luckily, I have 4 batteries so I can keep two on the charger at all times. While the preferable option is the have a functioning fiberoptic lamp, my Trail Rat substitute will work absolutely fine until I can find a replacement bulb.